Push, sync and share company email, contacts, and calendars right on your iPhone. Even keep in sync with your Outlook account. HyperOffice harnesses the power of iPhone’s technology to enable you to convert it into a thriving business collaboration tool. No matter where you or your team are, you can securely access corporate information, share it & work together on it. No matter where you update information – in the office, at home, or on your iPhone, it is automatically synchronized & updated. Instantly push corporate mail to your iPhone; access, share & synch contacts, tasks & calendars; access & share your Outlook data; collaborate on documents & much more! No servers or downloads. Just sign up & get started! If you are an Apple person, HyperOffice is fully enabled for access on your iPad as well. Keep information in sync between your iPad and iPhone. HyperOffice includes a business email service which lets you set up custom company email and push it to your iPhone. You can access your email on your iPhone or online on any PC or Mac. Access, share and sync your Outlook mail, contacts, calendars, & tasks with your iPhone with or without MS Exchange. Synch it back and forth. Keep your iPhone calendars and contacts in synch with official calendars and contacts. No matter where you update your mail, contacts, calendars or tasks – iPhone, online or Outlook, everything is automatically synched & mirrored. Share iPhone calendars and contacts with your teams and partners. If you like, you team will immediately know when you add an event, co-ordinate a meeting or create a contact. Only HyperOffice lets you store documents online, & access them & collaborate on them directly from the iPhone! Build unlimited intranets and extranets and access them easily from your iPhone. Industry-class 128-bit encryption, advanced spam filters and virus protection keep your information highly secure. 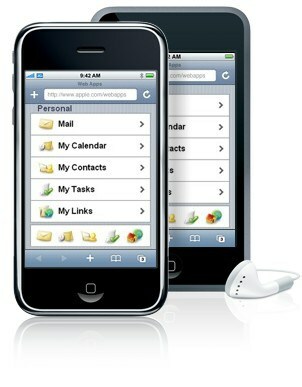 HyperOffice specially designed a web application for the iPhone which allows you full access to its collaboration features. It also allows you to use your iPhone’s native email, calendars and contacts. A web app is like any other iPhone application, only it runs on the phone’s integrated Safari web browser. There’s no need to download anything and no memory usage! Our web app has the functionality of traditional iPhone apps, including dials for selecting menu options and landscape views. For quick and easy access, web apps can be made to open from the iPhone’s desktop, or home screen. Simply use the Add to Home Screen button in the phone’s browser. You don’t need an expensive MS Exchange or SharePoint implementation to do the above things. Just sign up for HyperOffice and get going – set up business email, create individual and group calendars, store and collaborate on documents, create custom intranets and extranets, manage tasks, maintain contact directories, or integrate with Outlook. Don’t be chained to a single device for all this. HyperOffice keeps your information on the cloud and you can manage it over the air using any web enabled iPhone, PC or Mac in the world!